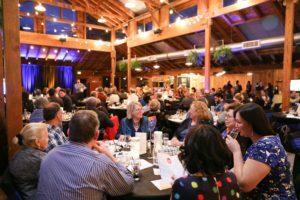 Another successful and enjoyable night of gathering with friends and supporters of the Suquamish Tribe was hosted by the Suquamish Foundation at the Kiana Lodge in Poulsbo. The evening’s theme “How Blue Jay Saved Daylight”, a story told by Suquamish parents to their children for generations, was incorporated into most every detail of the evening and artist and Suquamish Tribal Member, Kate Ahvakana, very graciously created the beautiful image “Sunrise Flight” that was showcased throughout the event décor that evening. Over 200 guests strolled into the elegantly relaxing atmosphere of Kiana to enjoy the jazz guitar playing of Suquamish Tribal Member, Maxwell Dawes. Once you’ve entered the beautiful atrium of Kiana’s dining area, you can’t help but notice the assortment of themed gift baskets donated by local businesses and original art work displayed for auction by Native artists such as Preston Singletary, Virginia Adams, Jeffrey Veregge and James Price. Our delicious 3-course dinner was followed by an exciting, fast-paced live auction and an enchanting Suquamish Tribal youth performance of a play based on the Suquamish legend “How Blue Jay Saved Daylight” featuring performers ages 2 years to 11 years old; Dionicio Lawrence, Amaya Lawrence, Everly Sigo, Corrina Sigo, and Shyla Villa. The youthful performers were assisted by Kylie Cordero and the performance was narrated by Suquamish Foundation Director, Robin Little Wing Sigo. The story-telling theme of the event and the participation of many of our Tribal children showcased the focus of our 2018 fund raising efforts on the new children’s playground to be built on the property known as Suquamish Shores, which is coming back into the Tribe’s ownership and will be transformed into a beautiful community area over the next several years. The playground will feature nature-based play structures of wood, sand and water echoing the stories and legends from our oral tradition. With the help of community, friends and sponsors, the Suquamish Foundation raised almost $59,000 towards the Suquamish community playground with natural play elements. 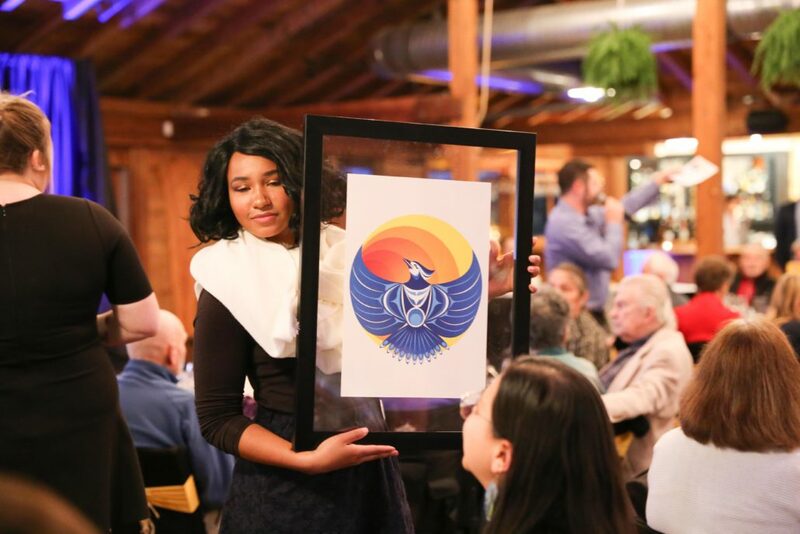 The Tribe is working with Suquamish storytellers, artists, dreamers and children to ensure that it will foster activity, dialogue, education and intergenerational connection so that we may incorporate many local Suquamish stories such as “How Blue Jay Saved Daylight” and “The Story of the Cruel Owls” into play. To see more photos from the event click here.